Realising that the home of Hymer at Bad Waldsee wasn't far from Bodensee we decided to meander north via Ravensburg (of jigsaw puzzles fame) where we couldn't find anywhere to park so after a circuit of the ring road continued across back roads to reach the Erwin Hymer Museum in an impressive new building on the edge of the town past the Hymer factory, although it wan't well signposted from the direction we approached the town. There were only a few visitors in the massive car park when we arrived. We handed in our van keys as security for the ipads we were given for the tour and were able to look around at our own pace (I can't stand guided tours especially in foreign languages!). 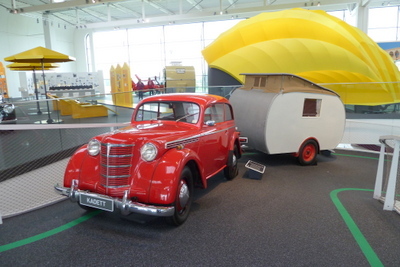 The displays are well laid out showing the history of touring holidays mostly with caravans in the early days and a few iconic motorhomes of various makes, not just Hymers. We found the products from the former GDR to be interesting in their designs and use of unusual materials. It was definitely worth the diversion for a few hours out of the rain. Overnight parking at the museum isn't permitted so we drove a few kilometres to the small town of Wolfegg where there is now a well laid out stellplatz. It was still raining the next morning as we drove back towards Friedrichshafen where I visited the Dorniermuseum at the small airport. Unfortunately it was too wet for the airships to be operating but I enjoyed looking at the many unusual Dornier aircraft designs especially the early multi-engined airliners. After a wet night at a campsite near Lindau we decided to head east and followed the Deutsche Alpenstrasse signs but saw none of the scenery due to the low clouds. Stopping at the "TopPlatz" at Nesselwang the brake pad light came on continuously so the next morning we headed to the larger town of Kempten where with typical German efficiency we had the front pads checked and replaced that afternoon at a Euromaster garage. Back on the road we decided to stay on the autobahn around Fussen where we have stayed previously. Taking heed of the signs as we crossed into Austria through a short tunnel we pulled into a busy service station to buy a 10 day vignette just to drive on a short stretch of autobahn. Suddenly the main road was very busy as far as Lermoos where we took the road back into Germany and spent a couple of nights at an ACSI discount site at Grainau near Garmisch-Partenkirchen. We visited the attractive town centre with traditional painted buildings and also drove to Eibsee where the rack railway takes you to the peak of Germany's highest mountain of Zugspitze but not that day as it was shrouded in mist. Good views in good weather! It was a dry morning but still in low cloud as we set off so we took the main road to Walchensee and on to Bad Tolz where the stellplatz was nearly full in the late morning as there was a garden festival in the local park. Luckily we found a place and walked across the bridge to the town centre with its attractive wide main street lined with large decorated buildings. We then spent a couple of hours at the garden festival which had many stalls selling interesting plants, garden products and typical German ornaments. We couldn't resist buying a wire mesh duck. Heading south-east towards the Bavarian Alps we turned off the main road to stop overnight at the small peaceful lake of Spitzingsee where we had stayed a few years ago. As it was still wet and misty we continued on the Deutsche Alpenstrasse to Oberdorf then crossed into Austria and through the crowded centre of Kufstein and on busy main roads to St Johann im Tirol. Taking a quieter route through pretty villages and failing to find a listed stellplatz at Hochfilzen (a hotel had been built on the site) we headed for an ACSI campsite at Maishofen for the night. We decided we had had enough wet weather so headed over the Alps in sleet via the 5 kilometre Felbertauern toll tunnel to be greeted by a steep diversion due to a landslide but now in sunshine! Passing through Lienz we took the road through a flat valley to the small village of Oberdrauberg and pulled in to the pleasant campsite (unusually all touring pitches) at the municipal swimming pool and stayed for a couple of nights enjoying pleasant strolls on level tracks along the river and to a nearby waterfall. We then headed to the Carinthian lakes reaching a campsite at Dellach on Millstatersee after a stroll around the town of Millstat with its old monastery and lakeside gardens. Taking the road over low forested hills to Feldkirchen we headed for Sankt Viet an der Glan where despite being a Saturday morning we easily parked on the roadside near the rather deserted town square. We strolled around the Hauptplatz and old town walls and then found the amazing brightly decorated modern hotel built in 1998 which looked somewhat out of place in a rather austere town. We noticed a nearby viewpoint marked on our road atlas at Magdalensburg so climbed up a narrow winding road to the summit where there was a chapel and hotel with terrific views in all directions. Returning to the main road we got tangled up on a poorly signed ring road around Klagenfurt to reach our destination at a pleasant ACSI campsite on the southern shore of the small lake of Keutschachersee. Now with warm sunshine a non-driving day was needed so we took a walk around the lake and then enjoyed a lazy sunny afternoon planning our route to Venice. The Minimundus Park was nearby so we visited it the next morning to look at the excellently laid out gardens with highly detailed models of famous buildings from around the world, although Britain was only represented by the Tower of London and a waterwheel on the Isle of Man. We then drove around Worthersee, finding a lakeside layby for lunch before passing through busy Velden and Maria Worth and back to the campsite. Now heading into Italy we visited a large motorhome dealership and camping store near Villach and took the main road rather than the autostrada passing through deep mountain valleys and small industrial towns before reaching the flatter plains, passing the walled town of Venzone which I recognised from when we came this way after our Slovenia trip in 2008. We then got taken in circles around the narrow streets in the centre of Gemona due to misreading the satnav but eventually reached our destination at the free sosta in the small town of Tarcento.